"The first duty of a man is the seeking after and the investigation of truth"
Cabinet secretary Sir Mark Sedwill and prime minister Theresa May have led tributes from across government to Lord Heywood after it was announced that the former cabinet secretary and head of the civil service died yesterday. Heywood, who retired on 24 October following treatment for cancer, made an “an immense contribution to public life”, Sedwill, his successor as cabinet secretary, said in a statement. “He joined the civil service in 1983, advising and supporting governments through some of the most challenging episodes of the last 30 years. Jeremy was the exemplary public servant. We will miss him more than we can say, and will be the poorer without his advice, leadership and extraordinary insight,” he said. Heywood “set the highest standards and challenged us to meet them,” Sedwill, who had been acting cabinet secretary after Heywood took a leave of absence in June until his retirement last month. “Jeremy was always looking to move difficult problems forward, restlessly confident to deliver a better way. He was a champion of innovation and embraced change while consolidating and protecting the best of history. He promoted a diverse and inclusive civil service, fit to meet the digital, commercial and policy challenges of the future,” Sedwill added. May, who is the fourth prime minister Heywood advised, said the many retirement tributes paid to Jeremy from across the political spectrum in recent weeks demonstrated his extraordinary talent supporting and advising prime ministers and ministers, and leading the civil service with distinction. Suzanne Heywood said that her husband had “crammed a huge amount into his 56 years”. In a statement, she said: “He loved his work as a civil servant and was hugely proud of his colleagues while always believing that they – and he – could and should do more, that there had to be a better way, a new way of looking at things or a fresh approach which would bring differing sides together. Those who worked with him found it a challenging, inspiring and rewarding experience. She said there would be a small private funeral in the coming weeks and a memorial service open to all at a later date. Among the others to offer tributes to Heywood were former prime ministers David Cameron, Gordon Brown and Tony Blair, all of whom Heywood worked with at Number 10 as either cabinet secretary, permanent secretary at Number 10 or principal private secretary. Heywood’s predecessor Sir Gus O’Donnell said Heywood was “a great, dedicated civil servant who worked tirelessly for his country, his political masters and his colleagues”. So sad to hear of the death of Jeremy Heywood, my successor. He was a great, dedicated civil servant who worked tirelessly for his country, his political masters and his colleagues. My thoughts are with his family who have supported him so well. Among the colleagues to offer tributes was Department for Environment, Food and Rural Affairs perm sec Clare Moriarty, who called him a “civil servant and public servant extraordinaire”. “He held the civil service through exceptionally challenging times and set a path that it will be our honour and privilege to follow. We will miss him greatly,” she tweeted. Jeremy Heywood’s contribution was immense. Relentlessly high standards, always kind to the individual. His leadership and friendship were a privilege and we will continue to follow his example @UKCivilService. My thoughts with his family on this sad day. Department for International Trade perm sec Antonia Romeo said it was “an incredibly sad day”, calling him a mentor, inspiration, and friend. “I’m proud to have served on his permanent secretary team. We will miss him hugely,” she added. Incredibly sad day. RIP Sir Jeremy Heywood. Mentor, boss, inspiration, unparalleled public servant, leader & champion of @UKCivilService, friend. Proud to have served on his Permanent Secretary team. We will miss him hugely. Home Office perm sec Sir Philip Rutnam said Heywood was “the outstanding public servant of his generation, and a very humane and kind man”. Jeremy Heywood was the outstanding public servant of his generation, and a very humane and kind man. We have lost a great leader of @UKCivilService but the greatest loss of all is to his family. Scottish Government perm sec Leslie Evans said Heywood was “a source of wisdom and support” she would miss greatly. Jeremy Heywood was an inspiration. We worked so closely together during my 6 years in No 10; he always had time, always focused on solutions. All my thoughts with Suzanne and their children. Farewell my colleague and my friend – our country owes you more than it will ever know. Jeremy Heywood was an impressive and dedicated public servant. My thoughts are with his family, loved ones and colleagues at this sad time. Deeply saddened by the news of Jeremy Heywood’s death. He was a superb public servant and his wise advice and sound guidance will be greatly missed. My deepest condolences to Suzanne and their children. The digital transformation of government is critical to the successful delivery of public services. As the world’s number one digital government, the UK leads the way in this. The Sprint 18 event – which is coming up on 10 May – will look at how we’ve built this world-leading digital government. And it will look at the work we, both in Government Digital Service and across departments, will be doing next. Sprint 18, at London’s Southbank Centre, will bring together ministers, colleagues from across government, international visitors, media, and industry figures. It is being organised by GDS, but it will be a chance for everyone involved or interested in digital government to celebrate the progress we’ve made, and to look to the future. Sprint 18 will show how these themes drive our work and our purpose – to help government work better for everyone. For example, we’ll hear from the Foreign and Commonwealth Office and Department of International Trade about how they’re using common components to build user-focused services. And we’ll hear from the UK Hydrographic Office about how they’re using innovative technologies to detect previously unknown shipping hazards. Oliver Dowden, minister for implementation, will talk about building a government that works for everyone, while apolitical chief executive Robyn Scott will look at what the UK can learn from other governments to remain a global leader in digital. For me personally, Sprint will provide a welcome opportunity to step back and consider what GDS has achieved during the time I’ve been here. I joined GDS as director general in August 2016, coming up for two years ago. Since then, the organization has delivered a huge amount. But before I detail these I want to talk about how GDS has become a better place to work. We’ve won awards for diversity and inclusion, including a Business in the Community award as one of the country’s best employers on race. GDS now has a gender-balanced management team, and 42% of GDS staff declare as female – in the UK technology industry as a whole this figure is 17%. The things GDS builds and operates are the foundation of government’s digital transformation. And we’ve seen an exponential shift in departments using these things. There are now more than 242 services using common components like payments platform GOV.UK Pay and notifications platform GOV.UK Notify. By using these components, service teams make it easier for users to make online payments and stay up-to-date about the progress of applications. In just over five years of live service, there have been more than 14 billion page views on GOV.UK – the single website for government, and the online home of our content and services. Meanwhile, GOV.UK Verify has been used more than 5.4 million times to access services, while GovWifi is now available in more than 340 locations across the country, including 100 courtrooms, local councils, schools, and hospitals, as well as the UK Border Force’s fleet of boats. Over the past two years, we’ve also seen a huge increase in collaboration between GDS and departments. This is particularly clear in two areas: controls and procurement. Working with departments, we’ve updated the Technology Code of Practice so that it provides the best and most relevant guidance to the government. Also working with departments, we’ve streamlined the spend controls process to ensure that it remains rigorous, but isn’t a blocker for departments. And we’re also taking this collaborative approach to improving procurement. The Digital Marketplace is a partnership between GDS and the Crown Commercial Service that is transforming the way government buys technology and digital services by opening the market up to small and medium-sized enterprise (SME) suppliers. A total of £3.2bn has been spent through the Digital Marketplace in just under six years. Of that total, 48% is spent with SMEs – that’s £1.43 of every £3. In fact, the Digital Marketplace has been so successful that we’re now going global with it. We’re working in partnership with the Foreign and Commonwealth Office to develop the Global Digital Marketplace. This aims to help international governments make their procurement more transparent, in order to prevent corruption and to boost their digital, data, and technology sectors. The Global Digital Marketplace is an example of how the UK is using its status as the world’s number-one digital government to work with and help other countries. We had 71 international government visits to GDS last year, and I am extremely proud of how we’re working with our global colleagues. I am also extremely proud of our role supporting the rest of the UK government as we prepare for EU exit. GDS is delivering and providing practical support across departments. The work we do around EU exit must have a long-term effect as well – it must lead to a transformed government. This means several things. It means continuing our work to build and maintain digital capability across government, through the expanding GDS Academy. The GDS Academy will have trained 10,000 students by October, and we’re expanding the curriculum to take in new subjects such as artificial intelligence. And to give us an overview of digital capability across government, we’ve launched the first national framework of Digital, Data, and Technology (DDaT) job roles. This has created a structure of 37 common job roles across government. And it means that GDS will be the place where new innovations for government digital are identified and tested. In the immediate term, we’re running the GovTech Catalyst scheme, to help private-sector innovators solve public-sector challenges. GDS is tackling a broad range of work, but we have a set of core principles and a core mission. We will show what good looks like, we will solve the hardest problems, we will help government transform, and we will reflect the society we serve. And by doing this we will help government work better for everyone. The Conservative government is facing a possible backlash and vote of no confidence from its voters in the coming elections over its treatment of migrants and their children who historically came to that Britain from the Caribbean in the 1940s and who later became to be known as the “Windrush Generation” of Britain. After the current Prime Minister, Theresa May had as home secretary said she would be tough on immigration and Amber Rudd the current home secretary has been accused of making up immigration policy ‘off the hoof’ to defuse the situation following the embarrassing debacle that saw hundreds of citizens being faced with deportation following home office rights to remain investigations into migrants living in Britain. More than 200 MPs have signed a letter to the prime minister calling for government promises to Windrush migrants to be written into law. Labour MP David Lammy, said concerns over compensation, housing, and legal rights had not been settled and Diane Abbott MP for Hackney has called for a full inquiry into whether the home secretary has breached ministerial code from the Government’s immigration targets. The Home Office said Amber Rudd would speak in Parliament on Monday The home secretary is accused in the letter of making up immigration policy “on the hoof” to defuse the situation. The letter addressed to Theresa May, said any promises made by the government in response to the Windrush crisis should be enshrined in law “without delay”. But what was the effect of the Windrush Generation – let us look at just how important this migration was and look back at the benefit to Britain from that the Windrush generation of black afro-Caribbean Britons who settled in the United Kingdom. The Empire Windrush voyage from the Caribbean to Tilbury took place in 1948. If it hadn’t been for the Second World War, the Windrush and her passengers might not have made the voyage at all. During the war, thousands of Caribbean men and women had been recruited to serve in the armed forces. When the Windrush stopped in Jamaica to pick up servicemen who were on leave from their units, many of their former comrades decided to make the trip in order to rejoin the RAF. More adventurous spirits, mostly young men, who had heard about the voyage and simply fancied coming to see England, ‘the mother country’, doubled their numbers. June 22nd, 1948, the day that the Windrush discharged its 492 passengers at Tilbury, has become an important landmark in the history of modern Britain; and the image of the Caribbeans filing off its gangplank has come to symbolize many of the changes which have taken place here. Caribbean migrants have become a vital part of British society and, in the process, transformed important aspects of British life. In 1948, Britain was just beginning to recover from the ravages of war. Housing was a huge problem and stayed that way for the next two decades. There was plenty of work, but the Caribbeans first clashed with the natives over the issue of accommodation. But alongside the conflicts and the discrimination, another process was taking place. Excluded from much of the social and economic life around them, they began to adjust the institutions they brought with them – the churches, and a co-operative method of saving called the ‘pardner’ system. At the same time, Caribbeans began to participate in institutions to which they did have access: trade unions, local councils, and professional and staff associations. By the start of the seventies, West Indians were a familiar and established part of the British population, and they had achieved more than mere survival. One indication of their effect on British life is the Notting Hill Carnival. the carnival took place in the same streets where West Indians had been attacked and pursued by baying crowds, but it began as a celebration, a joyous all-inclusive testimony to the pleasure of being alive. As it developed, it became clear that there was a British festival where everyone was welcome, and everyone who wished to had a part to play. Throughout the seventies, the children of the first wave of post-war Caribbean migrants began to develop a ‘black culture’ which is now part of a black British style shared by Africans, Asians and white young people alike. The people of the Windrush, their children and grandchildren have played a vital role in creating a new concept of what it means to be British. To be British in the present day implies a person who might have their origins in Africa, the Caribbean, China, India, Greece, Turkey or anywhere else in the spectrum of nations. The now-familiar debate about identity and citizenship was sparked off when the first Caribbeans stepped off the Windrush. Alongside that debate came the development of arguments about the regions within the United Kingdom – Scotland, Wales, and Northern Ireland. The British national self-image has been thoroughly remodelled in a very short time. Seen against the deadly agonies associated with ethnic conflicts in other European countries, Britain offers the example of a nation, which can live comfortably with a new and inclusive concept of citizenship. In a sense, the journey of the Windrush has never ended. Our definitive guide to all benefits and tax credits is an essential resource for all professional advisers serious about giving the best and most accurate advice to their clients. Newly restructured, the handbook is now easier to use and it has been refocused to bring universal credit to the fore. Fully indexed for ease of use and cross-referenced to law, regulations, official guidance and court decisions, Upper Tribunal and commissioners’ decisions, the handbook also offers tactical information on common problem areas and advice on how to challenge decisions. The Welfare Benefits and Tax Credits Handbook is an essential resource for welfare rights advisers, lawyers, local authority staff, social workers, union officials and claimants. Cover price £61 and for CPAG members and CAB customers £51.85. This is Una Cooze, (b. 1929 – d. 2001) a woman I had the pleasure of meeting and working closely with as she briefly worked for Ken Livingstone during 1991-1992 when his own secretary was on maternity leave. Una was the constituency secretary for Michael Foot for many years dealing with the correspondence on behalf of both MPs — writing to local authorities, government departments such as the home office, foreign office, department for work and pensions (the benefits agency as it was then known) and always writing diligently to each and every constituent that met both MPs initially having discussed their individual situations. I met her in the offices of Norman Shaw South, which along with the Norman Shaw North Building is part of UK Parliament buildings and were, of course, more famously the seat of the Metropolitan Police as Old Scotland Yard. She was a long-standing member of the Labour Party and an active T.U.C member and a lifelong socialist, this is probably why she remained an asset to the late great Michael Foot. I have fond memories of talking with her and was amazed at her ability to recall each and every constituent in the Willesden (London Borough of Brent) area. David Cameron is taking on a new job with US electronic payments firm First Data that will see him work as a “brand ambassador” for the technology business, the company has announced. The former prime-minister’s part-time role with the Georgia-headquartered business was cleared by anti-corruption watchdog the Advisory Committee on Business Appointments in July, according to a just-published decision letter. Like other former ministers and senior civil servants, Cameron was required to notify ACOBA of his plans so it could offer an opinion on the job’s suitability. Last month the body voiced concern after former GCHQ director Robert Hannigan’s appointment to a role with US cybersecurity firm BluteamGlobal was publicised before it had considered his request. ACOBA said Cameron’s request to work for First Data was acceptable, provided that he did not seek to use the privileged information he had access to as prime minister for his work with the firm, or lobby the UK government on its behalf until July next year – two years after he left office. Committee chair Baroness Angela Browning said she had consulted Cabinet Office perm sec John Manzoni on Cameron’s appointment, which is the sixth he has successfully sought clearance for since he stood down as prime minister after failing to secure a “remain” victory in 2016’s EU referendum. “He confirmed that the government has no links with First Data in its procurement frameworks and has no concerns about you taking up this appointment,” she said. The event took place on 17th August 2017 hosted by the Constituency Labour Party with an introduction by Cllr Tom Beattie on the discussion of the increase of the pension age to 67 years to those born in the 1950’s and State Pension Age increase in years to come. “Older people have been badly let down by the Tories. During this year’s General Election they failed to provide transitional protection to women born in the 1950s who have had the increase in their State Pension Age (SPa) accelerated; in addition, they failed to guarantee they would protect the State Pension ‘triple lock’ and Winter Fuel Allowance. Most recently the Government announced that they will be accelerating the increase in the SPa to 68 at the same time it was announced that increases in life expectancy had ‘ground to a halt’. This contrasts to the Labour Party’s manifesto pledge to retain the triple lock and winter fuel allowance, as well as provide support for the 1950s born women through pensions credit and further transitional protections. Labour has also rejected the accelerated increase in the SPa to 68 and is examining options for a flexible retirement age. The visit to Corby Cube was part of the Shadow Secretary of State for Work and Pensions national tour gaining public ideas and proposals in re-examining the State Pension and incentivising Private Pensions. The driver of the rented van that purposely collided into worshipers leaving a mosque in Finsbury Park, North London that left one man dead and eight people severely injured in a suspected anti-Islamic terror attack has been named as Darren Osbourne (47) from Cardiff. Darren Osborne, 47, has been named as the driver of the van was initially apprehended and detained by members of public immediately at the scene and then formally arrested by police in connection with the incident. Mr. Osborne was taken to hospital as a precaution and will be taken into custody once discharged and also be subject to an assessment as to his mental health the police confirmed. Scotland Yard said armed police were at the scene within minutes and Police responded according to witnesses almost immediately. Police have said an investigation will be carried out by Counter Terrorism Command and extra officers deployed to reassure Muslims during Ramadan. Passers-by said a crowd had gathered to help an elderly man who collapsed on the pavement and was already undergoing CPR when the vehicle approached. The local Iman, now whose actions are being described as heroic, urged the crowds gathered who had cornered the driver, Darren Osborne to remain calm whilst apprehending him. Most people just kept asking ‘why? Are you killing people’ One woman was thrown from a wheelchair as people fled from the careering van. People described bodies and blood on the pavement. A spokesperson for the Metropolitan Police said officers were called to a “major incident” at 12.20am. The London Ambulance Service’s special response teams and an advanced trauma crew were sent to the scene. “Our priority is to assess the level and nature of injuries and ensure those in the most need are treated first and taken to hospital,” he added. A second tragedy has befallen London in the last few days. We all woke on Wednesday to see the most distressing scenes of a towering inferno in the London Borough of Kensington and Chelsea, Lancaster West area of London. Although the extent of such a tragedy was difficult to comprehend it was by many residents a disaster almost waiting to happen, and even followed a report by Housing regulation inspectors into the blocks refurbishment following concerns of the safety of the building that saw gas pipes in communal areas bare, a complete lack of fire sprinklers and the use a lower grade of building cladding provided to the exterior of the building. Of course, you may be as shocked as I was at the fire, and it’s ferocity and we as a country share deepest sympathy and grief for all either who perished and their families and also for the survivors who are rebuilding their lives after such a disaster. My question goes out to KCTMO the landlord involved and concerned with this particular housing disaster, why did they sign the refurbishment as satisfactory when important safety requirements were not met? Why after 72 hours did the Prime Minister only first start to address residents and the local community about the disaster and does she really expect that the £5 million will be adequate to the survivors (we do not know yet the numbers who perished and those who survived) who now must rehouse themselves and rebuild their lives? Why did Kensington and Chelsea Housing Chiefs today not address the local community or provide any assistance in knowing the estimated number of tenants involved? Below are the scenes we have witnessed over the last couple of days that will haunt people and which now demand a total long-awaited overhaul of Housing Safety. Source: Sadiq Khan, Mayor of London, wrote in the London Evening Standard. “As the Mayor of London, it’s difficult to adequately describe the grief and anger that we Londoners are feeling following the attack on our city on Saturday evening. Three sick and twisted individuals indiscriminately murdered innocent people as they enjoyed a night out in the heart of our great capital. The emergency services, as they always do, responded heroically and I thank them all on behalf of our city. The first armed police were on the scene within minutes and bravely brought the terrible attack to an end swiftly after their arrival. Some suffered injuries in the line of duty. The London Ambulance Service and NHS staff worked throughout the night to treat the injured. And once again, brave bystanders confronted the terrorists and helped the victims. It’s still early days but our police and security services are doing everything in their power to investigate this attack. They are also working to prevent an incident such as this happening again. The national security level remains at severe — meaning an attack on us is highly likely. I am in constant contact with the Metropolitan Police Commissioner and other senior officers and attended the Government’s emergency Cobra security meetings yesterday and today. It is just over two months since the terrible attack on Westminster Bridge and only two weeks since the horrific attack at Ariana Grande’s concert in Manchester. The police and security services have foiled five other attempted attacks since March alone. This shows the scale of the threat we face and why we must always remain vigilant and prepared against the terrorist threat and report anything suspicious to the authorities. Keeping our city safe is my greatest responsibility and is the part of the job that keeps me awake at night. You will see an increased police presence on London’s streets over the coming days — including more armed officers. They are there to keep you safe. Over the coming weeks and months, we must do everything possible to stop an attack like this ever happening again in our City. We must defeat this threat. Our values must prevail. We should not jump to knee-jerk conclusions, but failing to act is simply not an option. We need to look seriously at whether the police have the resources they need to prevent these incidents — and whether additional police working more effectively within our communities, building confidence and improving the information they can obtain would make these attacks less likely. We need to work with communities, the Government and others to tackle extremism in our midst. This perverse ideology is overwhelmingly despised by every community across London — of all faiths and none. By working together we must deprive extremism of its oxygen and not exaggerate its support or alienate communities in the process. The Government must now urgently act — and I am keen to work with them to build on what we have learnt. We have to make it harder for extremists to radicalise young people online. It is too easy for people to access extremist propaganda on the Internet — with websites and videos glorifying their evil ideology just a click away. After every terrorist attack, we rightly say that the Internet providers and social media companies need to act and restrict access to these poisonous materials. But it has not happened. This is not a simple task — and must be done by working together with the companies — but now it simply must happen. This is the holiest time of the year for millions of Britain’s Muslims. Ramadan is a period of peace and contemplation for the suffering of others. Followers of a perverse ideology who murder innocent Londoners and visitors are an utter desecration of Ramadan and a rejection of the true values of Islam. Along with the overwhelming majority of the Muslim population, I am disgusted by this act. I want to send a crystal-clear message around the world: the sick and wicked ideology of these evil extremists is no form of Islam that I recognise. I unequivocally denounce them and their twisted beliefs. We cannot allow these evil terrorists to change our way of life. That’s not to say that we don’t feel angry or heartbroken — of course, we do. But the terrorists commit these horrific acts because they want to scare us into submission. They cannot win if we don’t let them. Instead, we must carry on enjoying the freedoms and way of life that they hate so much. That’s why Thursday’s general election will go ahead as planned because to postpone it would be to play into the hands of those who want to undermine our democracy. My thoughts and prayers are with the friends and family of everyone affected. Every life lost and injury suffered is a heartbreaking tragedy for a family and a community. As a city, we must now come together to grieve and pay our respects to the victims of this dreadful attack. We will hold a vigil in Potters Fields Park — a short distance from the horrific attack and next to City Hall — this evening at 6 pm for all Londoners and visitors to join us. We will show the world that we remain as defiant and unbowed as ever. The way our city pulled together in the aftermath of the attack on Westminster Bridge inspired the world. Londoners know that our anger must be directed at the extremists and terrorists. We know that the strength of our communities and our tolerant and liberal values make us more resilient against the terrorists. British police have within the last couple of hours rushed to an incident on London Bridge on Saturday after witnesses said a van ploughed into pedestrians and one witness has said a knife attack has taken and that she saw people who may have had their throats cut. British Transport Police said casualties were reported after an incident that may have involved 3 men getting out of a van that struck people and then conducting a knife attack. The London Ambulance Service said it was sending multiple resources to the incident. Police said armed officers were also responding to an incident in the nearby Borough Market area of the city. Police have said a witness confirmed a stabbing incident. The Prime Minister is aware of the incident and will receive updates of the attacks that have just taken place in the three locations; the van attack that took place 10.15pm at #LondonBridge, then the attack at #BoroughMarket and reports are now also coming in of an attack at Vauxhall and the police are clearing people from these areas and have put a security alert in the #Vauxhall area. Vauxhall Underground station just re-opened. One witness told Reuters that she saw what appeared to be three people with knife wounds and possibly their throats cut at London Bridge. Reuters was unable to immediately verify her account. Another witness told the BBC she saw a speeding white van veering into pedestrians. That witness said the van hit five to six people. Reuters television pictures showed dozens of emergency vehicles in the area around London Bridge. Several witnesses have also reported hearing gunshots. London’s transport authority said London Bridge rail station had been closed at the request of the police. Police confirmed at 00.20am this morning as that the incidents at London Bridge and Borough Market as a terrorist attack’ ; it follows the recent terrorist attack in Manchester where 22 people were killed, and is also worrying close to Thursday’s General Election on 8th May. A security guard who oversees a number of pubs in the area told the BBC he saw four people stabbed by three attackers. The man, was deeply shocked and asked not to be identified, said a colleague had informed him that there was a stabbing at the Borough Bistro pub nearby. As he went towards the pub he witnessed people running and said there was screaming he witnessed he three attackers and brandishing a long knife and stabbing people, including a girl in her early 20s. One eye witness described how he believed to be a man with a knife and strapped to his body he believed to be canisters – he was however quite distressed following the incident. Teresa May will hold an emergency security meeting later on Sunday morning. The huge cyber-attack affecting organisations around the world, including some UK hospitals, can be traced back to the US National Security Agency (NSA) – raising questions over the US government’s decision to keep such flaws a secret. Elements of the malicious software used in Friday’s attacks were part of a treasure trove of cyber-attack tools leaked by hacking group the Shadow Brokers in April. One of the tools contained in the Shadow Brokers leak, codenamed EternalBlue, proved to be “the most significant factor” in the spread of Friday’s global attack, according to cyber-security firm Kaspersky Lab. The tool was said to have been created by the NSA – though, as is typical, the agency has neither confirmed nor denied this. EternalBlue was made public on 14 April, and while Microsoft had fixed the problem a month prior to its leak, it appeared many high-profile targets had not updated their systems to stay secure. Friday’s attack has reignited the debate over whether or not governments should disclose vulnerabilities they have discovered or bought on the black market. “It would be deeply troubling if the NSA knew about this vulnerability but failed to disclose it to Microsoft until after it was stolen,” said Patrick Toomey, a lawyer working for the American Civil Liberties Union. “These attacks underscore the fact that vulnerabilities will be exploited not just by our security agencies, but by hackers and criminals around the world. Edward Snowden, who famously leaked many internal NSA files in June 2013, criticised the NSA on Friday in a series of tweets. “In light of today’s attack, Congress needs to be asking [the NSA] if it knows of any other vulnerabilities in software used in our hospitals,” he wrote. However, others focused the blame at institutions for being too slow in updating their systems, given that this attack happened almost two months after a (free) fix was made available by Microsoft. “Say what you want to say about the NSA or disclosure process,” said Zeynep Tufeki, a professor at the University of North Carolina. For the UK’s National Health Service, the problem is perhaps more acute. Security firms have continually raised alarms about the NHS’s reliance on Windows XP, an operating system that is no longer supported by Microsoft. Blogger tells BBC how he ‘accidentally’ halted the Ransomeware by discovering a “kill switch” inside the Malware. “A UK security researcher has told the BBC how he “accidentally” halted the spread of the malicious ransomware that has affected hundreds of organisations, including the UK’s NHS. The 22-year-old man, known by the pseudonym MalwareTech, had taken a week off work, but decided to investigate the ransomware after hearing about the global cyber-attack. He managed to bring the spread to a halt when he found what appeared to be a “kill switch” in the rogue software’s code. Although his discovery did not repair the damage done by the ransomware, it did stop it spreading to new computers, and he has been hailed an “accidental hero”. “I would say that’s correct,” he told the BBC. A suspected terrorist attack occurred today at outside the Palace of Westminster on Westminster Bridge, in Parliament Square in central London. A vehicle was driven into a crowd of people near the palace gates, and an attacker stabbed people, at least one of them being a police officer. Four people are confirmed to be dead including a armed police officer guarding the Palace of Westminster and Parliament square, a woman mowed down on Westminster Bridge, and a third victim, and the unknown knife attacker who was shot by armed police who quickly attended the scene. 20 people are confirmed injured from the bridge attack. Parliament; Westminster Hall, Portcullis House and both Norman Shaw South and North buildings are currently in lockdown with many MPs and their staff waiting for safety clearance. Parliamentary business is suspended until tomorrow. The attack happened at around 14:40 on 22 March 2017, a grey Hyundai on Westminster Bridge ran into approximately 10 individuals, before crashing into railings. Following that, a man wearing black clothes was seen stabbing a police officer with a knife in Old Palace Yard. After he was warned, two plainclothes police officers shot the individual three or four times. The Metropolitan Police counter-terrorism unit at New Scotland Yard have asked people to come forward with information and have closed most of the bridges in central London including Lambeth Bridge, Westminster Bridge, Tower Bridge. Shortly after the incident, additional armed police arrived. An air ambulance attended the scene and emergency services attempted to resuscitate the assailant. Injured members of the public were taken to St Thomas’ Hospital, which is located around 200 metres south of Westminster Bridge. Tobias Ellwood MP attempted to provide resuscitation and stem the bleeding of an injured police officer. After the incident, Parliament was suspended and MPs were locked into the Commons debating chamber as a precaution, and other Parliamentary staff were told to remain in their offices. All were later evacuated to Westminster Abbey. Prime Minister Theresa May was evacuated to 10 Downing Street. Westminster tube station was closed and buses diverted as a precaution. The River Thames was shut between Vauxhall Bridge and the Embankment immediately after the attack. The London Eye was placed in lock-down. The incidents are being treated by the Metropolitan Police as a terrorist attack and asked the public to avoid the area including Parliament Square, Whitehall, Westminster Bridge, Lambeth Bridge, Victoria Street up to the junction with Broadway and Victoria Embankment up to Embankment Tube station. The UK government’s emergency Cabinet Office Briefing Room (COBRA) committee will meet later today. Channel 4 news last night named a possible suspect however it was understood that the man they alleged carried out the attack is in prison. However its been announced that police now believe that attacker to be Khalid Masood (52) who is believed to have not been under surveillance by the security service. The House of Lords Science and Technology Committee launches an inquiry into the priorities for nuclear research and technologies. In 2011 the Committee investigated whether the UK’s research and development (R&D) capabilities were sufficient to meet our nuclear energy needs in the future, ensuring a safe and secure supply of nuclear energy up to 2050. This inquiry will now revisit some of the conclusions and recommendations of that report and investigate whether the Government’s actions in response have improved the UK’s nuclear R&D capabilities. 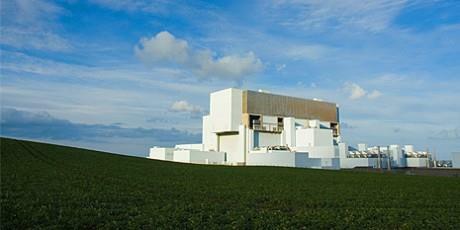 It will also explore what more needs to be done to ensure the UK can meet its future nuclear energy requirements. The Committee will look specifically at the upcoming decision by the Department for Business, Energy and Industrial Strategy on a small modular reactor (SMR) design for the UK; whether the roles and remit of the National Nuclear Laboratory (NNL) are appropriate; and if the Nuclear Innovation and Research Advisory Board (NIRAB) was successful. The Committee invites submissions, with practical examples where possible, on topics including those mentioned below. “It has been over 5 years since the Committee’s report into the future of nuclear energy which found that the Government was too complacent about the UK’s nuclear R&D capabilities. Since its publication, the Government has accepted and acted on a number of the recommendations of the Committee, which saw the creation of the Nuclear Innovation and Research Advisory Board. This inquiry gives the Committee the opportunity to assess who should have responsibility for ensuring the UK has a coherent and consistent long term policy for civil nuclear activities. We are keen to hear from people or organisations who can inform the Committee on the role and remit of the National Nuclear Laboratory or offer insight into how SMR’s will benefit the UK and what is needed to support the civil nuclear sector”. The Committee is inviting written evidence on the issue, to be received by Friday 24 February 2017, and will start taking oral evidence on the inquiry in February. This pack has been prepared ahead of the debate on Animal Welfare Standards in Farming after the UK leaves the EU (Brexit), to be held in Westminster Hall on Tuesday 24 January 2017 430-530pm. The Member in charge of this debate is the Rt Hon Theresa Villiers MP. Animal welfare is a devolved issue. The welfare of animals involved in commercial operations (i.e. those animals that are farmed) is subject to a substantial body of EU regulation; the RSPCA estimates that around 80 per cent of UK animal welfare laws originate from the EU. The terms of the Brexit negotiations will have a significant impact upon what animal welfare protections are adopted, amended or discarded. •Freedom from fear and distress. Similar legislation implementing EU animal welfare regulations exists in England and all of the devolved assembles. Accompanying the legislation in each country are codes of practice, which provide welfare recommendations for those involved in the farming industry. EU rules to protect live animals during transport and related operations were agreed in 2004, and implemented in the UK in 2007, though there have still been a number of campaigns against such exports on welfare grounds. These regulations only apply to animals transported for commercial operations. The Council Regulation was implemented in the England by the Welfare of Animals (Transport) (England) Order 2006, and by parallel legislation in Scotland, Wales and Northern Ireland. There have been a number of campaigns seeking to either ban live animal transport altogether, or to limit how far (and long) an animal can be transported on welfare grounds. Some of these campaigns have focussed on live animal exports through the Ports of Ramsgate and Dover, and specific events in 2012 when 40 sheep were euthanised on welfare grounds at the Port of Ramsgate. The National Farmers Union (NFU) is broadly supportive of live animal exports. In the past, it was normal practice for antimicrobials to be added to animal feed across the world in order to stimulate livestock growth and so maximise productivity. A ban on the use of antibiotics as growth promoters was implemented first in the UK and then in other European countries and Canada. The practice continued unchanged, however, in the United States and also continued to some extent in Europe, but with agents that were not used therapeutically in humans. An EU-wide ban on the use of antimicrobials as growth promoters came into force on 1 January 2006. The addition of antimicrobials to animal feed for medical purposes (either as prophylactics or as treatment for existing disease) is not affected by this ban. On 10 September 2014, the European Commission adopted a proposal for a Regulation on veterinary medicinal products. Brexit and farm animal welfare: the same protections, stronger or weaker? It is currently expected that leaving the EU will result in alternative trade and support arrangements for UK agriculture. The terms of Brexit negotiations and trade deals will go a long way towards determining what animal welfare protections are adopted, amended or discarded. This may lead to the same, stronger or weaker regulations than those currently in force. The Government has already committed to bringing forward a ‘Great Repeal Bill’ which will convert all existing EU law into domestic law “wherever practical”. However, there has been some concern that trading arrangements made with non-EU countries may result in a reduction in UK standards or in the standards of imported products. In order to operate on a ‘level playing-field’, farmers may call for the removal of welfare regulations which would allow them to compete with producers in countries with lower animal welfare standards. The contents of the current (11th) edition of Robert’s Rules of Order Newly Revised (RONR), published in 2011, include details on the types of groups that use the book, the ways that decisions could be made, and the various situations in which decisions are made. The introduction in the book provides a history of parliamentary procedure and includes the background and history of Robert’s Rules of Order. Rules in the book are based on the rights of the majority, of the minority (especially a strong minority that is greater than one third), of individual members, of absentees, and of all these together. Some fundamental principles upon which the book is based include: one question at a time; one person, one vote; and a vote being limited to members present. A group that uses the book is called a deliberative assembly. The types of deliberative assemblies are a mass meeting, a local assembly of an organized society (local club or local branch), a convention, a legislative body, and a board. An organization may have rules which could include a corporate charter, a constitution or bylaws, rules of order (special rules of order and parliamentary authority), standing rules, and customs. To conduct business, groups have meetings or sessions that may be separated by more than or be within a quarterly time interval. The types of meetings are a regular meeting, a special meeting, an adjourned meeting, an annual meeting, an executive session, a public session, and electronic meetings. A member of a deliberative assembly has the right to attend meetings, make motions, speak in debate, and vote. The process of making a decision is done through a motion, which is a proposal to do something. The formal steps in handling a motion are the making of a motion, having a second, stating the motion, having debate on the motion, putting the motion to a vote, and announcing the results of the vote. Action could be taken informally without going through these steps by using unanimous consent. When making a choice, the basic principle of decision is majority vote. In situations when more than majority vote is required, the requirement could include a two-thirds vote, previous notice, or a vote of a majority of the entire membership. Details for each motion include its purpose, when it could be made, if it is debatable, if it is amendable, the vote required for adoption, and if it could be reconsidered. The “order of precedence”, or rank, of the motions is also described in detail. Depending on the situation, motions could be renewed, or made again. On the other hand, members should not use legitimate motions for dilatory and improper purposes to waste time. A quorum, or minimum number of members, is required to be present at a meeting in order to validly conduct business. The business that is to come up in a meeting could be listed in an order of business or an agenda. Each member could get a chance to speak through assignment of the floor and debate. Debate may be limited in the number of speeches and time and should be respectful to others at all times. Voting takes place to decide the course of action and it could be done in a multitude of ways, such as voice vote, standing vote, and ballot vote. Officers in an organization could be elected through the process of nominations and elections. Each organization decides for itself which officers to have, but the minimum officers in a deliberative assembly are a presiding officer (usually “president” or “chairman”) and a secretary. The secretary keeps the minutes, or the official records of the proceedings, for each meeting. As part of their duties, the officers may have reports to give, such as a financial report given by the treasurer. In addition, an organization may have a board to handle business on behalf of the organization. Officers and boards only have such authority and powers that are given to them in the governing documents of the organization. There may also be committees that are formed to assist the organization. The boards and committees may have reports to give as well. People may gather in mass meetings for a specific purpose or cause. One such purpose of the mass meetings could be for the intent of organizing a permanent society. Each organization has its basic rules contained in its bylaws. The bylaws could describe the name of the organization and its purpose, the requirements to be a member or an officer, how meetings are scheduled, if there are boards or committees (or both), its parliamentary authority, and how to amend the bylaws. Representatives from constituent groups may gather as delegates in conventions to conduct business on behalf of the organization. Conventions may consist of several meetings and may last for several days or more on an annual basis or other such infrequent interval. If members do not act according to the organization’s rules, they could be subject to disciplinary procedures. Such action could range from censure to the extreme of expulsion from the organization. Officers could be disciplined by removal from office. The tinted pages (pages marked by a gray band along the outer edge) in the rear of the book contain the following charts, tables, and lists: (1) Chart for Determining When Each Subsidiary or Privileged Motion Is In Order, (2) Table of Rules Relating to Motions, (3) Sample Forms Used in Making Motions, (4) and (5) Motions and Parliamentary Steps, (6) Motions Which Require a Two-Thirds Vote, (7) Motions Whose Reconsideration Is Prohibited Or Limited, and (8) Table of Rules for Counting Election Ballots. Ask your local Councillor to pressure Government into action today. In May 2016 the Government made a commitment to work with local councils to bring unaccompanied refugee children in Europe to safety in the UK, under an agreement called the “Dubs scheme”. Three months on and they have completely failed to deliver on this promise. Liberty and Help Refugees are campaigning to hold the Government to account and make this pledge a reality, and we need your support. Demonstrating local support for the Dubs scheme sends a strong message to central Government that the time to act is now – and that councils are keen to play their part. Write to your local councillors using our form below. Ask them to sign up to our statement pressuring central Government into honouring their commitment. “We welcome the Government’s commitment to create a resettlement scheme to bring unaccompanied refugee children in Europe to safety in the UK. We recognise and support the vital role that local councils can and should play in caring for children seeking sanctuary. A full list of councillors who have pledged their support to the statement can be viewed here. Writing to your local newspaper is a great way of bringing the desperate plight of unaccompanied asylum-seeking children to the attention of your community, council and local MP. It will be instrumental in persuading local councillors to sign up to Liberty and Help Refugees’ Protect Refugee Children campaign. To help you get your message across, here are some tips for writing to your local paper. Child refugees endure violence and separation from family members; lose access to education, healthcare, the support of their communities and often face bleak and uncertain futures. As a recent harrowing report from UNICEF revealed, trauma does not end at Europe’s shores. Children seeking sanctuary across the continent face routine exploitation and abuse. Many have already disappeared into the hands of traffickers. The UK has a long tradition of providing refuge to those escaping persecution and indiscriminate violence. In May 2016, the Government committed to create a scheme proposed by Lord Dubs – himself a child of the Kindertransport – to bring refugee children stranded in Europe to safety in the UK. The time for action is now. Local and central government must work together to ensure the Dubs scheme fulfils its potential as a lifeline for some of Europe’s most vulnerable children. Currently huge question marks remain around funding for the regional infrastructure that will ensure consistent and high quality services across the country. The whole process of resettlement – from assessment overseas, through placement with individual councils, to accessing essential services – must be rooted in the best interests of the child and adequately resourced. Together we can hold the Government to account. Offering sanctuary to those fleeing war and terror is one of the most pressing human rights issues in the UK today. By demonstrating local support for the Dubs scheme we send a strong message that urgent action is needed, and that local councils are keen to play their part. Add your voice: Tweet this . . Founded in 1934, Liberty is a membership organisation at the heart of the movement for fundamental rights and freedoms in the UK. The government will support the Homelessness Reduction Bill, the communities secretary has announced. Sajid Javid, in parliament today, confirmed ministers will back the bill, which would impose duties on councils to prevent homelessness. Ministers had previously said they would consider options, including legislation, to prevent homelessness but until today had stopped short of supporting the bill. The bill, tabled by Conservative backbench MP Bob Blackman, has been supported by homelessness charities. It is made up of 12 measures (see below). A new version of the bill was published last week following negotiations with bodies including the Local Government Association. The original bill included a new duty on councils to provide emergency temporary accommodation for 56 days to people with a local connection but who are not in priority need and who have nowhere safe to stay. Councils have said that such a duty would place too much pressure on local authorities, which are already struggling to keep up with spiralling homelessness demand. This duty has now been removed from the bill, on the basis that it would be too costly. Jon Sparkes, chief executive of Crisis, said: “In backing Bob Blackman’s Homelessness Reduction Bill, the government has shown its continued determination to tackle homelessness. I am also grateful for the personal tenacity and commitment shown by Department for Communities and Local Government ministers in helping get to this important milestone. The bill is due to receive its second reading in the House of Commons on Friday. It still needs the support of 100 MPs to protect the bill from risk of being ‘talked out’. 1. A change to the meaning of “homeless” and “threatened with homelessness”. Each household that has received an eviction notice is to be treated as homeless from the date on which the notice expires, and the period at which a person is threatened with homelessness is changed from 28 to 56 days. 2. All homeless people have access to free advice and information. 3. Local authorities are required to carry out an assessment of what led to each applicant’s homelessness, and set out steps to remedy this in an agreed, written plan. 4. Local authorities are required to help to secure accommodation for all eligible households who are threatened with homelessness, and at an earlier stage. 5. Local authorities are required to provide those who find themselves homeless with support for a further period of 56 days to help to secure accommodation. 6. Local authorities are able to take action to help to secure accommodation under the new duties to help homeless households. 7. Households in priority need who refuse to co-operate with prevention and/or relief activity will be offered a minimum of a six month private rented sector tenancy. They will not progress to the main homelessness duty. Households not in priority need who refuse to co-operate would be provided with advice and information only. 8. All young people leaving care will be deemed to have a local connection in the area of the local authority that is responsible for providing them with leaving care services under the Children Act 1989. 9. Applications are provided with the right to request a review in relation to the prevention and relief duties. 11. The Secretary of State has a power to produce a statutory Code of Practice to raise the standards of homelessness support services across the country. 12. A local housing authority must satisfy itself that specific requirements are in place where it secures accommodation for vulnerable households in the private rented sector. It seems the outcome of the European Referendum has caused political mayhem for both party’s , Labour and Conservative, in the likely event of leadership contests. The likely candidates for the conservative leadership being Michael Gove v Boris Johnson; and today political shenanigans appear to have started in both parties as its discovered that an email from Sarah Vine (Michael Gove’s wife) expressed concerns over a Boris Johnson winning candidature as Conservative Leader. Meanwhile Jeremy Corbyn is fighting his own corner in expressing the public support he has from the electorate in challenging the vote of a no-confidence in a Parliamentary Labour Party vote today which he lost. It’s obviously not been a good week for Jeremy Corbyn; mass resigning of his cabinet over the sacking of Hilary Benn, many of opposed the leadership anyway; and a disastrous public new shadow cabinet press conference where suddenly after asking the cameras be switched off a ‘game of musical chairs’ took place without Tom Watson appearing near Mr Corbyn (Watson is believed to have rallied opposition to Jeremy Corbyn from safe distance of Glastonbury during this weekends Glastonbury Festival). 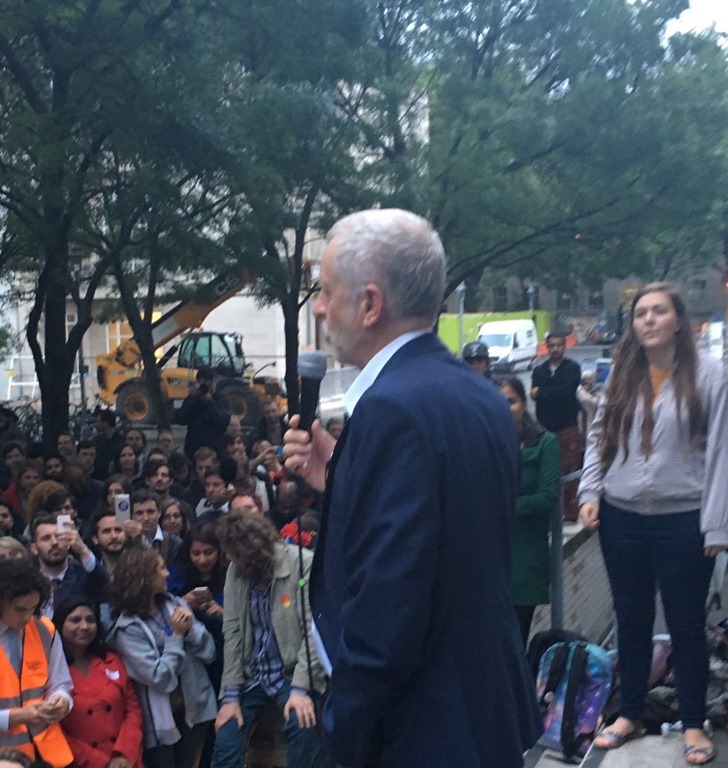 Mr Corbyn has held a public address today outside the School of African and Oriental Studies. A Public Rally had been set to have been held outside Bloomsbury in London but was cancelled earlier today by Momentum because of “overwhelming demand’. Mr Corbyn mainly had applause for standing his position as leader but there was some levels of heckling from some in the crowd assembled. Queen Elizabeth has today celebrated her 90th birthday. She has been now almost 65 years on the throne of the United Kingdom and the Commonwealth and Britain’s longest serving monarch and the second longest current monarchs in the World . 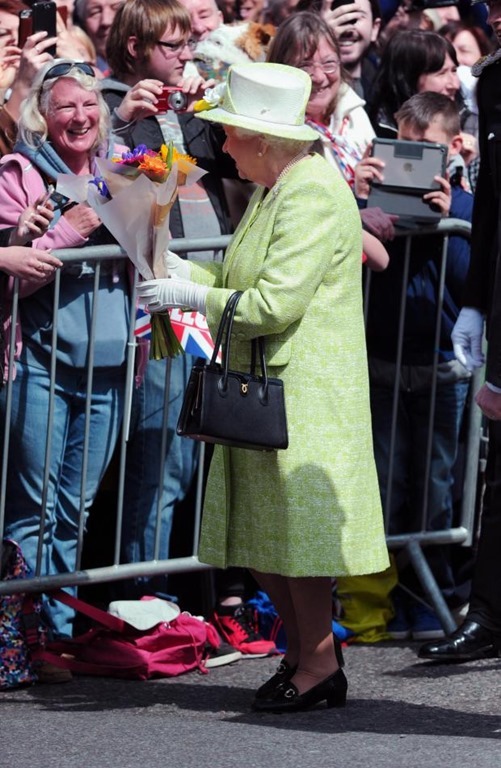 Today the Queen spent the day earlier with her husband Philip, The Duke of Edinburgh, on a walk about the town of Windsor where crowds assembled to wish her a happy Birthday. She was also presented with a birthday cake at Windsor’s Guildhall by Nadiya Hussain winner of BBC’s “Great British Bake Off” television programme. She also unveiled a plaque to the “Queens Walkway” that links important points within Windsor. She is due to meet President Barack Obama tomorrow when he will be visiting to show his birthday respects to the Queen, it’s also said that there will be a ban on all aerial drones in parts of London later this week during his visit to the capital for security reasons following recent incidents where drones have been causing danger to aircraft. He and his wife Michelle are expected to also lunch with Princess Kate, Prince William and Prince Harry during his visit. He later is expected to meet David Cameron and stand politically with him in urging Britain to stay in the EU.